In conclusion of National Volunteer Week, we would like to introduce you to another one of our volunteers, Florence Stubblefield. 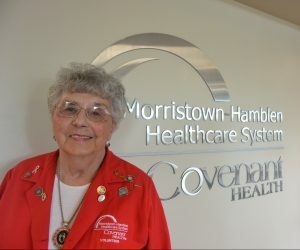 Florence has been a volunteer at Morristown-Hamblen Healthcare System over 25 years and has the most accumulated volunteer hours. From her start date till the end of March 2019, Florence has volunteered 17,733.25 hours. We are so blessed to have dedicated volunteers like Florence. While volunteering various days, she will greet you with a big smile and uplifting attitude as you come in the hospital front entrance. Before volunteering in the MHHS front lobby, Florence helped out in the critical care waiting room, day surgery waiting room, and in the JBC gift shop. She was also an asset in the volunteer office by assisting previous volunteer director, Mary Bell, with daily clerical responsibilities. Florence’s favorite part about volunteering is being able to help others including cheering people up or just simply smiling. She also enjoys spending time with her fellow volunteers. Florence’s late husband, Earl, also volunteered at MHHS. He volunteered in the emergency room and was one of the past presidents of the Volunteer Auxiliary Board. Florence is a blessed mother, grandma, and great-grandma. She enjoys traveling and some of her favorite memories were the trips she took out west to Colorado with Earl. One of her favorite hobbies in the past was counted cross stitch. Another thing Florence enjoys is cooking. Her specialty is chocolate desserts. Florence is a member of the Morristown Church of Christ. They have a ministry where they come every other Monday and distribute pillows throughout the hospital. Florence really enjoys being a volunteer and said she will continuing doing it as long as she can. We hope you enjoyed getting to know Florence Stubblefield as well as all our other volunteers this week. If you are interested in exploring the possibilities of being a volunteer, please visit www.morristownhamblen.com/volunteers.